Let me set the scene. 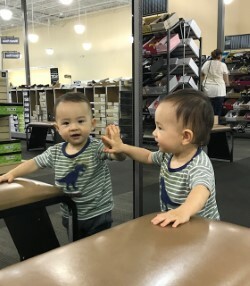 Me, in the middle of DSW, trying to find a decent pair of black dress shoes with a heel that won’t send me to emergency and a style that won’t make me feel like the rest of my outfit is from the thrift store. (Because it probably is). Ellie is yanking down boxes at random faster than I can put them back and pulling off her cowboy boots to ‘try them on’. Benji has screamed and twisted his way out of his stroller and is on the ground on all fours actively looking for disgusting things to put in his mouth. I glance down at the price. I glance up. He’s two rows away and tripping a hapless shoe employee. Ellie is waving her arms trying to balance in a pair of purple heels-so-high I’m dizzy ‘shoes’. I can’t even call them shoes. They’re like Halloween decorations you’d put on the mantle but never, ever, actually put your FEET into. Anyway, so that’s the scene. I have time to glance at the other shoppers, leisurely choosing which color, which style. Standing and trying them on, putting them carefully back into the box and moving on to the next. 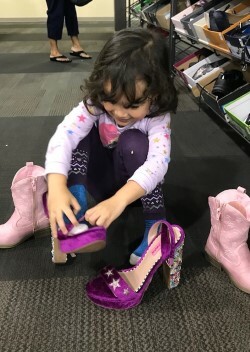 While I wistfully gazed at those lucky leisure shoppers Benji found a mirror to lick and Ellie actually managed to fasten those ‘shoes’ on her feet and was struggling to stand. I could feel my impatience and irritation rising. I just wanted a pair of shoes! Why was this so hard? And then I remembered, Be Here, Now. Be here, in this moment. Lean in. So Benji was babbling loudly and licking everything he can get his hands on. So Ellie was making a little mess and chattering nonstop so I can’t bring a thought of my own down into my brain. Once I did this, let go, accepted the moment, it changed. I don’t know how to explain it but something seemed to shift and I realized the shoes she was struggling with were actually hilarious. And beautiful, in their own LOOK AT ME NOW kind of way. And Benji looked at me and laughed his little baby laugh, so happy to be exploring someplace new. And I rocked back on my heels and smiled too. Why was I getting so worked up? Just then one of the older ladies I had watched jealousy as she explored shoes unfettered by babies turned to me and said, “Enjoy every minute. It’s the best time of your life.” And all my ‘be here now’ peace went out the window and I said, “Yeah, I’m sure when I’m sleeping at night again it will all seem better.” Whoops. Did I say that out loud? Yes, yes I did. And she kind of started, looked at me again, and smiled, and I could tell she was remembering some long forgotten argument or accident or melt-down. She nodded and went back to shoe-picking. She understood me. And I understood in that moment she missed her kids, was lonely, and longed for the days filled to the brim with noise, action, need, and bustle. There is no time to think, or be lonely, or even really be sad when you’re constantly ‘on the clock’ with young kids. There is only survival and the hope of rest at the end of the day. It's exhausting, and beautiful, and so special I fight not to worry all the time about what could go wrong. It occurred to me as I gathered my monkeys and managed to get through the check-out line without blowing up the store that most people assume they were happier in the past, or they WILL be happy when….and it’s a total, absolute myth. I was looking at that older woman longing for days when I have more freedom, she was looking at me longing for the days she could have her babies close to her again. Neither one of us was present. Neither one of us was Here, Now. Neither one of us was happy. Once again circumstances seem to evolve so that I can learn how to be more present. When I’m focused on being fully in this moment I am, if not happy at least content. It seems to open up my tight heart and let more love and gratitude flow through. Now who doesn't need more love and gratitude in their lives? Maybe, just maybe if I keep doing this I can accept those well meaning comments with equanimity and compassion, instead of just barely resisting the urge to scream, cry, and yank their eyebrows out. “You know when you’re a mom when sleeping in until 8AM feels as magical as riding out of your bedroom on a unicorn.” Anonymous.